USANA scientists wrote an article on the differences - "What changed in the Essentials/CellSentials Formula" . It will be interesting to see what the article says about the new formula and at the same time look at the differences that Vitamin Inspector shows when it does a software comparison on the labels. Will Vitamin Inspector agree with what the USANA scientists have said? Will it find other changes? The formula for Essentials and CellSentials changes depending on where it is sold in the world. The USANA article concentrates mostly on the differences in the United States market. This review will also concentrate on the US market. Almost two-thirds of the ingredients have been modified in either dose or form of ingredient. This was asssessed by counting the changes shown. 3 x removals (Pomegranate, Cinnamon and Bilberry extracts). "The Essentials provided beta-carotene as the only source of vitamin A activity. The CellSentials deliver a combination of beta-carotene, retinyl acetate, and mixed carotenoids to provide vitamin A activity." Some people do not convert beta-carotene to Vitamin A efficiently, hence USANA has added retinyl acetate because it is more easily turned into Vitamin A. "The Essentials provided vitamin E primarily as alpha-tocopherol. The CellSentials provide a more balanced approach to vitamin E activity with a lower dose of alpha-tocopherol and a much greater dose of mixed tocopherols (gamma, delta, and beta-tocopherols), all of which supply vitamin E activity." "The CellSentials have a much larger dose of vitamin K than the Essentials. The CellSentials also have the addition of vitamin K2." True. The dose is 8 x greater and Vitamin K2 is also present. "The CellSentials InCelligence complex has a much greater dose of Meriva curcumin, green tea extract, quercetin, hesperidin, and N-acetyl L-cysteine. The CellSentials have an increased dose of alpha-lipoic acid, and resveratrol was added to the complex." NB: It is easier to see these changes using CellSentials vs Essentials this time. In some markets folic acid was decreased in the CellSentials, in comparison to the Essentials. True. There is 40% less Folic Acid in CellSentials. The CellSentials contain over double the Choline of the Essentials. Yes. There is 2.5 times more choline in CellSentials. How does Vitamin Inspector's comparison stack up against the USANA Scientists' article? The comparison by Vitamin Inspector backs ups what USANA says about the changes in their product. It also shows some other changes that are not mentioned by USANA. 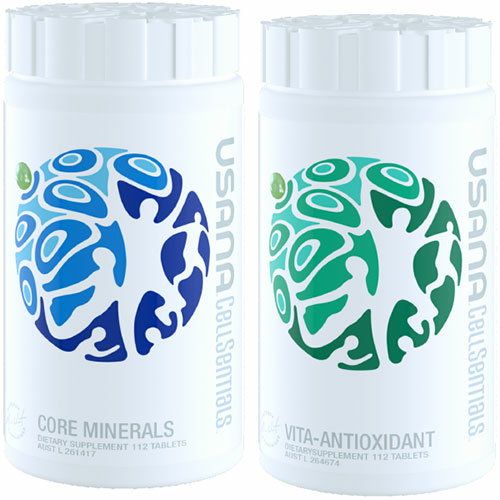 Note: Vitamin Inspector compared the USA product and the USANA review was about their global product. This review supports all the statements made by USANA and shows that Vitamin Inspector is indeed a good tool to find the differences between complex mutli-vitamin products. USANA seem to have good reasons for making changes to their forumula. Read the full article here. You can support Vitamin Inspector by making a donation or buying one of the products compared. There could also be other changes which Vitamin Inspector cannot assess, for instance, in the composition of extracts. Changes to inactive ingredients have not been counted. Vitamin Inspector compares the ingredients stated on the label. It does not test multi-vitamins or other supplements. Nutritional Comparison, compares only the active ingredients line by line, not the 'other' or 'inactive' ingredients.